1.) 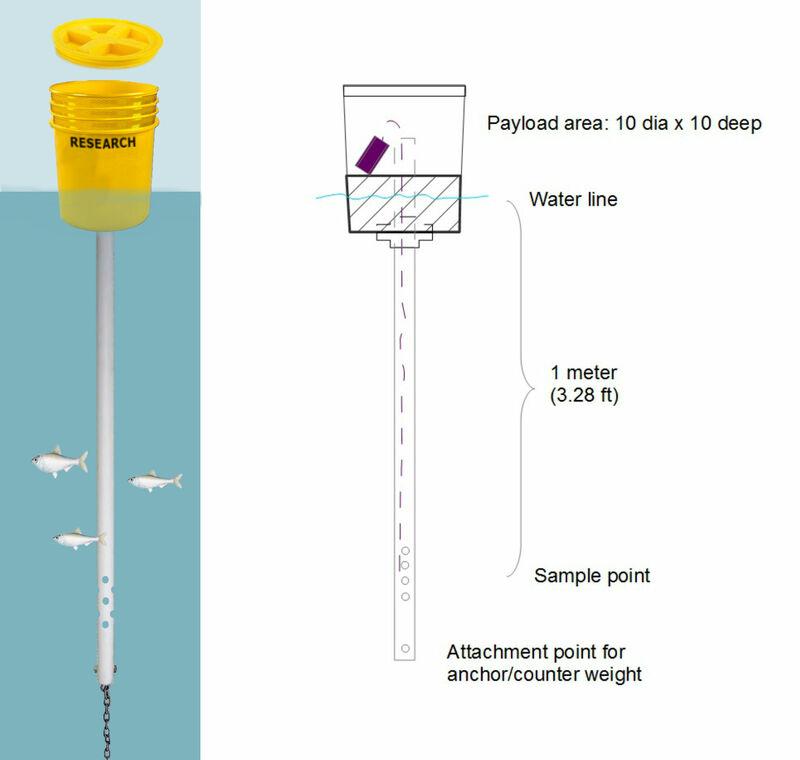 measure parameters at a water depth of 1 meter like commercial instruments 2.) protect electronics from the elements while being easy to open and reseal 3.) have room for expended capabilities like larger rechargeable batteries and solar panels to support remote access plus other sensors like air temperature or solar intensity 4.) not sink 5.) look respectable, e.g. not confused for trash or something that would give the public concern. I started by looking at different buoy designs for various purposes. They seem to all be made of some sort of plastic skin, metal reinforcing frame, and varying types of foam. Not surprisingly all the commercial research buoys are expensive. The cheapest, most basic version I could find costs $1500. While I want to keep costs down, I also want this to be a durable and reusable device. My first design used mostly PVC pipe. It looked nice on paper but looking at components at the hardware store I thought it seemed a little too small and had limited expansion opportunity. Yet, I think this is a viable design for a small compact sensor. 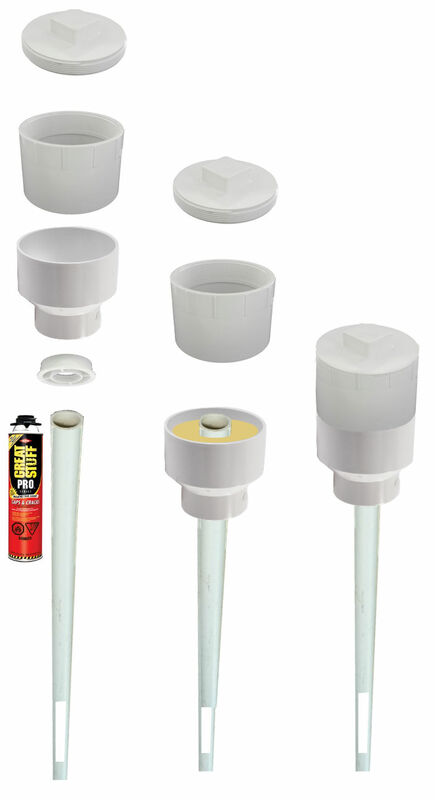 This disign uses PVC schedule 40 pipe (6" cleanout, 6" to 4" reducing coupling, bushings, and 1-1/2" pipe) with spray in foam and costs about $50 in parts. More if you need to buy whole containers of primer, cement, and foam, which you just need a little of each. Looking for bigger payload capabilities, I made a second design using a plastic bucket as the top. It's impervious, cheap, sturdy, and available in yellow! Yellow seems to be the color of choice recognized world-wide for research buoys and some 3M marine reflective tape will help prevent it from getting run over at night. Some of the larger buoys have a light beacon for collision avoidance but this buoy is pretty small in comparison. A screw top lid would make access easier than prying bucket lids. For the probe I plan to attach 1-1/2” Schedule 80 PVC pipe using flanges. I chose Sch 80 only because I couldn't find Sch 40 flanges. Then in the bottom of the bucket, I plan to pour/spray in foam to a volume of 2 gallons forming it in place. Aside from adding buoyancy the foam will also help provide structural rigidity to the bucket and keep the probe straight. I considered adding some metal framing here or a weight at the bottom but I don't think it's necessary. I will consider adding a top plate above the foam and possibly a third flange. Displacing 2 gallons of water, the foam will float about 16.7 lbs. so even if the bucket is full of water, the buoy should not sink. I estimate the whole buoy empty will weigh 8 lbs and then the payload probably wouldn't exceed like 4 lbs. I'm concerned it might be tipsy and the solution for that would be to add weights at the bottom of the probe, which a 3/8” mooring chain is about 1-1/2 lbs per foot, so a couple feet of chain might just stabilize the buoy enough. 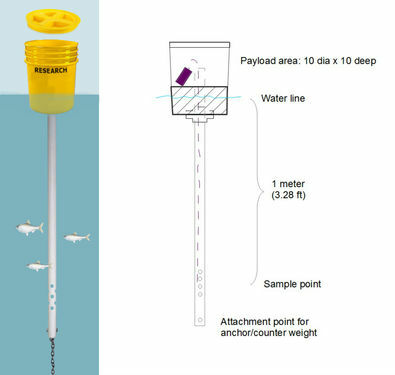 The buoy could support up to about 4 lbs of counter weight on the probe without exceeding the sink threshold. 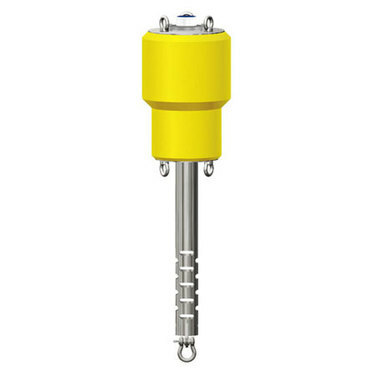 With the leverage and water resistance it shouldn't take much weight at the end of the probe to stabilize the buoy. For the probe I'll drill holes at the sample depth of 1 meter to allow water to mix around the sensors. I thought 1-1/2” pipe would be large enough to contain the necessary probes and also offer structural support since the buoy is anchored by the probe end. The bucket buoy would also cost about $50 each not including the primer, cement and foam, which you just need a little of each. So what do you think of the designs? Is 1-1/2” pipe (inner diameter) sufficient for all the sensors? What should we call it? Right now I just call it the pvc buoy and the bucket buoy. There are a few details to work out, like how to cover the top of the probe but I think a plastic bag and an elastic band should work fine. I'm not sure if adding a vent from the top of the probe to the outside air would help relieve air pressure or just be extraneous. Once I build it and see how she sails I'm sure there will be something that needs adjusting. Thinking WAY ahead, I thought it would be neat to combine a few ideas here and combine the riffle with the thermal fishing bob and put it on a buoy like this to visually cue the water temperature to the public. An array of these devices along a river could have a neat, artistic effect. I presume you will use a chain to connect this to a weight. Does this design have enough buoyancy to carry the chain wieght? The PVC design looks good, keep the price down. Out of safety concern. Where are you going to put this. If it will be put where other people can reach it. It needs to be bigger and a bright color. It need to be visible. You do not want to go over it with a boat and mess up your propeller with a couple of meter of chain. Same issue for night time. You may need to put a flashing light on top of it so it is visible. @gpenzo the 2 ft. of chain would serve as the counter weight, then the chain would connect to a rope which is connected to an anchor. the foam displacement alone should be able to support the 2 ft of chain, which is about 3 lbs. Placement and visibility is a major concern. It would have to be located outside of navigation channels and one would probably want to consult with the local governing authority--harbor master, state agency, and/or coast guard--before anchoring. I agree that the chain getting wrapped around a prop is probably the greatest hazard to passing boats but it's not that much different from a mooring buoy or even a lobster buoy. The coast guard approved reflective tape will help and a flashing beacon would be great but they are expensive. It's a bit of a gamble but I think for the low coast approach, such as the Riffle sensor, you just have to accept that this bucket design has an inherent amount of risk whereby a crushing boat collision could sink the whole device. It begs the question: how much do you want to pay to protect your low cost sensor? I considered putting another, smaller bucket (2 gal) inside the 5 gallon bucket and then filling the annular space with foam but it seems like overkill. Yet, if one were going to deploy more expensive instruments then you probably would want to invest in a metal framed buoy to protect them--and that would be fun to build too but much more expensive.